With 27 phenomenal holes of golf, Golf Costa Adeje is regarded as one of Tenerife's premier golfing destinations. Even in its short history, it has played host to some prestigious events, culminating with the 2003 Canaries Spanish Open, when the course welcomed the European Tour's most famous names. Situated near Tenerife ’s southern tip, Golf Costa Adeje is in a great location, the popular holiday region of Playa de las Americas is just ten minutes away, meaning the hotels, beaches and bars are within easy reach. Costa Adeje is a must-play course in Tenerife, ranking in the top 10 in the Canaries and top 85 in Spain. We found 31 offers matching your search. The original 18 holes were opened in 1998, and are now known as the Old Course. 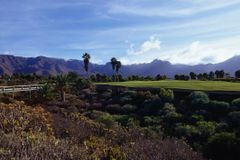 The fairways are generous, and is perhaps most memorable for the views of the coastline and La Gomera Island. The Old Course is maintained to an impeccable standard thanks to a state-of-the-art irrigation system, and is a glorious place to enjoy a round of golf. Overlooking the sea, the new Los Lagos course is a newly added nine hole loop that has further emphasised Golf Costa Adeje's quality. Although it is considerably shorter than the Old Course, it is a technical challenge that requires guile and creativity. No less than 6 lakes are interspersed in the layout, and is a great little test for golfers of every standard. The complex also boasts an excellent golf academy, where the highly skilled and multilingual PGA professionals are on hand to offer personalalised tuition or group lessons. One of my top fave courses anywhere - great condition and great location. Always enjoy playing here. the course is in fairly good condition, the greens are quite good, the terracing of the fairways is something we are not used to, and so we found it sometimes a bit confusing were we could / could not go with the buggy due to safety reasons of course. overall enjoyed it. Brilliant course in great condition.